- 100MHz bandwidths;1GSa/s Real Time sample rate. - Large (7.0-inch) color display, WVGA(800x480);Record length up to 40K. The Rigol DS2102A is a very high quality two channel digital storage oscilloscope. The GDS-1000A-U series provide a unique solution. The GDS-1000A-U lineup includes GDS-1152A-U model. 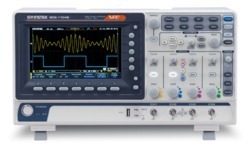 We are leading suppliers and Distributor of Colour Digital Oscilloscopes. • The highest Single real-time sampling rate can up to 1Gsa/s; Equivalent sampling rate is up to 50GSa/s. 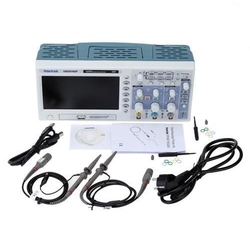 Features: 200 MSa/s real-time sample rate 40~ 100 MHz Bandwidth Equivalent Sampling up to 50 GS/s Roll mode, acquire and display slow moving signals Waveform Recorder Built-in FFT Extended 12 div. waveform display Color and Mono STN LCD displays 10 waveform and 10 setup storage Automatic measurements and Manual cursor measurements Built-in Frequency counter Exclusive.